We’re a home school family. Our school year is winding down. Yes, I know it’s only March but when the weather is yucky we hit it hard. As it begins to turn into spring we are literally crossing subjects off our list. Boom. Knowing the fifty states and their capitals is one goal I have for my kids this school year. My oldest attended public school through the sixth grade and doesn’t know this. I have my Masters degree in education and have to say I couldn’t pass a test either. But, learn them we shall- together! Each page contains a few facts that your kiddo may or may not know off the top of their head. Mine will not know all of these facts. Thanks to the wonders of the internet and the amazing resources out there these facts will be easy to find! Instead of just writing all of the facts there is room to do some sketching as well. It will take them a bit longer to draw a cardinal or Mt Rushmore or Buzz Aldrin than it would to write the words. By drawing and putting a bit more thought into the process some of that information will sink into their squishy little brains. 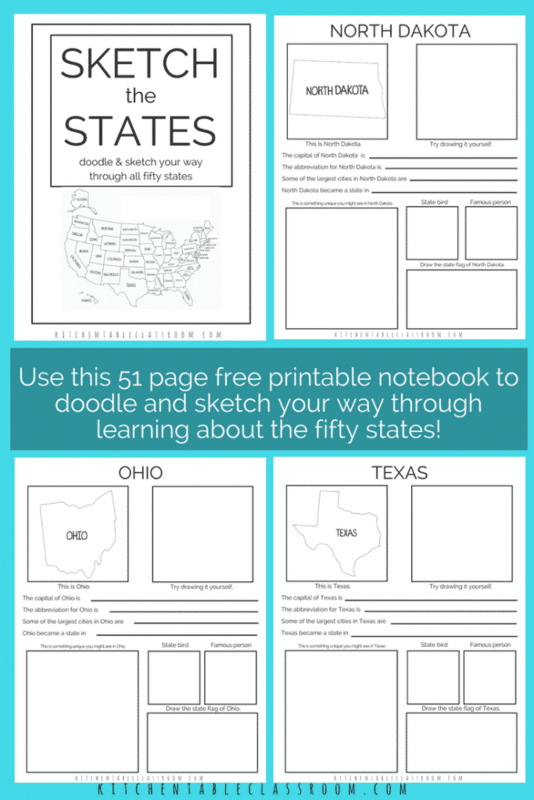 Wanna’ grab the fifty states printable book??? It’s free, no catch! Just use the turquoise subscribe button below to sign up for my weekly email. Upon confirming your subscription you will receive a subscriber only password to my Free Resource Library. This printable book as well as dozens of other free printables will be there waiting for you in easy to print PDF form! We’ve added in some fun resources like this Scrambled States of America game and we have more than one map of the United States puzzle in our puzzle cabinet. These are just fun little “extras” that fit in a little extra practice here and there. I know there tons of other great resources out there for learning the fifty states and adding a little geography into your day. Do you have a favorite at your house? 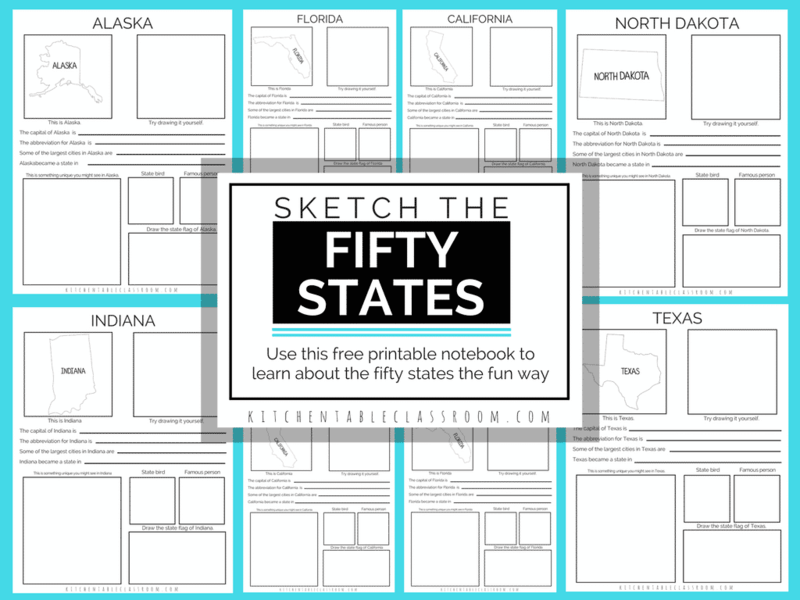 If you found this printable sketch book about the fifty states useful then please share it on your faovirte social media channel! Every single share helps me to grow the Kitchen Table Classroom and bring you more free printables and fun projects!